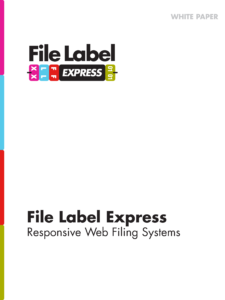 File Label Express PRO adds true database functionality to the standard printing of file labels. In high or low use environments adding PRO to your account gives you true Records Management at an affordable cost. Creates a searchable database of records in the system Allows for dynamic reporting of file system data, based on any file index or any custom index identified by the user as useful in reporting on the file system. Allows addition of retention schedules with and available “Retention” Field, which can readily indicate records that are eligible to be destroyed with a simple search. Creates the ability to compile detailed listings of records going to storage which lowers the cost to introduce and retrieve records in storage. With the advanced “label switching” technology built into PRO, multiple labels can be rendered from the same data utilizing a “key” field which will switch the label design on the fly. This is especially useful where a file status, as in “’Active” or “Inactive” must create a secondary label. File Label Express PRO provides a bridge between simple label printing and complex records and content management. Utilizing PRO allows the user to compile file system data that is useful in reducing costs when the files are converted, destroyed or archived in long term storage. Start Using PRO Today for only $29.95/month with unlimited users!